There are two Smoketrees available for landscape use, but the most popular or at least the most available is the exotic or imported Common Smoketree (Cotinus coggygria) which comes from Europe and Asia. Our very own native American Smoketree (Cotinus obovatus) is believed by many landscape designers including me to be the more attractive tree, but is often difficult to find. 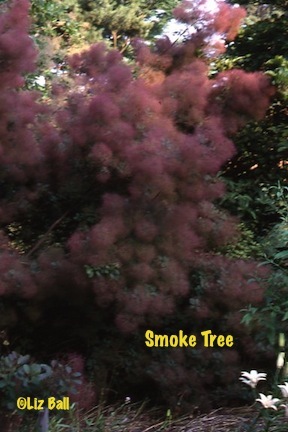 So here is a case where if you want to try a Smoketree, go American. Most folks think that the smoky look of this tree comes from the flowers, but that is not the case. The yellow green blossoms are quite inconspicuous. The smoke effect comes from the billowy hairs that are attached to elongated stalks on the spent flower clusters. These hairs turn a smoky pink to purplish pink for a lengthy part of the summer, thus covering the tree with fluffy, hazy, smoke-like puffs. It is truly a unique and beautiful addition to any home landscape.